HERM SPRENGER Silent Dog Whistle. The Silent Dog Whistle is designed with a quiet high pitched note a human ear is unable to hear over long distances. Whereas, a dog can pick up this sound at a distance of up to 400 yards. Depending on the direction and strength of the wind. 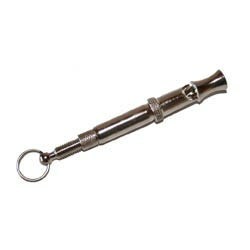 The silent dog whistle can be an essential tool when working with your dog. Specifically ideal for long distance, tracking, and training work with your dog. This whistle is nearly inaudible for humans yet clearly audible to Dogs. With a range of 15-400m. It has a permanent pitch which is set by the locking nut on the adjustable screw. It also features a plastic sleeve that protects the adjustment. Made from highly polished Nickel Plated Brass. For help and assistance speak to your local dog trainer on how to incorporate the use of the whistle into your dog’s training and also everyday activities.